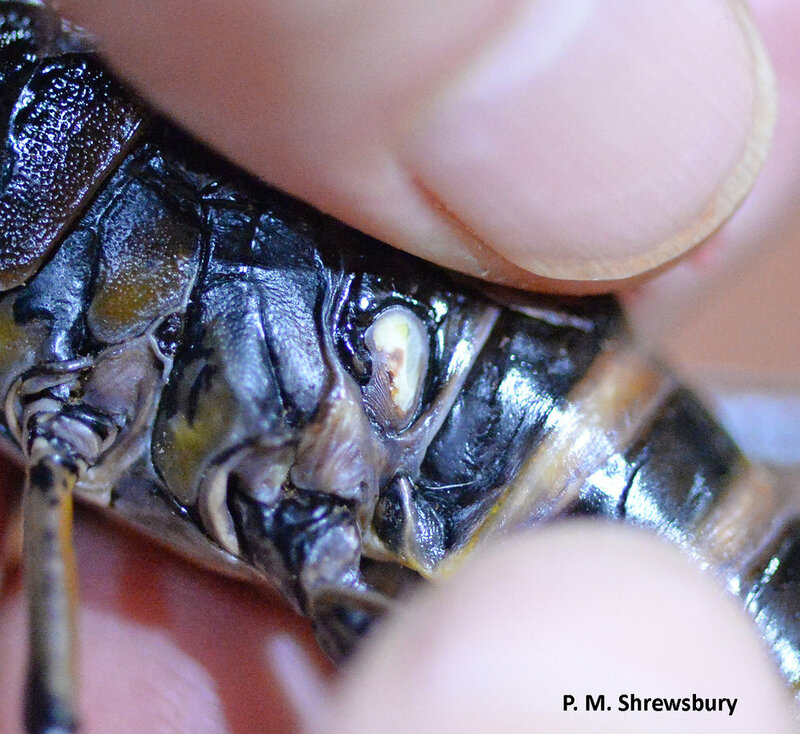 Lubber locusts are among the largest of insects found in the United States. While continuing our escape from chilly weather in the mid-Atlantic, let’s make a stop at the fantastic Audubon Corkscrew Swamp Sanctuary, near Immokalee, Florida. Along miles of boardwalk trails, thousands of species of animals and plants indigenous to the western region of the Everglades can be enjoyed up close and personal. Upon arrival to the sanctuary as we moseyed through the cypress glade, we were greeted by a very friendly and somewhat curious lubber grasshopper that kept pace with us on the handrail lining the boardwalk. One would think that this brightly colored creature, the largest locust in the United States, would evade humans and be wary of enemies or perhaps employ camouflage to avoid the beaks and jaws of hungry predators. But, oh no, this and several other of its harlequin kin were boldly in the open walking, dining, or mating. So what special powers do lubber locusts possess to move about a dangerous landscape with impunity? Whether it’s a romantic interlude in the sunshine or a stroll along the boardwalk to gawk at some humans, heavily defended eastern lubber locusts seem to fear no one. Wicked spines on legs can stab the flesh of attackers. In a recent episode we learned the clever morphologies and behaviors used by giant Australian walking sticks and twostriped walking sticks to thwart enemies. Lubber grasshoppers possess similar defenses but kick it up a notch by adding chemical warfare to their arsenal. First we’ll take a look at some defensive morphologies and behaviors. The body of lubbers is protected by sturdy plates of chitin, body armor that can withstand attacks of many smaller predators. Lubber legs are festooned with rows of strong spines, self-demonstrated to be capable of piercing human, and presumably, reptilian flesh. Certainly, the powerful jaws of the lubber would be deterrent to predators. The Latin epithet, microptera, found in the species name of this critter literally means “small wing.” Indeed, wings of the lubber are so small they are no longer functional for flight. This locust moves through the world on legs rather than wings. However, the hind wing of the lubber serves another very important function. Its brilliant scarlet color serves as a warning to visually astute predators. Gregarious and gaudy lubber locust nymphs advertise their defenses with bright orange stripes on a jet black background. When threatened, lubbers and other grasshoppers will regurgitate noxious gut contents colloquially known as ‘tobacco juice’ that may be repellent to predators. Those with lubber experience learn that messing with lubbers will result in punishing chemical warfare. The first line of chemical defense, one regularly employed by many insects, is vomit. Across the insect realm from caterpillars to grasshoppers, regurgitation of disgusting gut contents is often employed as a defense when predators attack. As kids we learned that grasshoppers would regurgitate ‘tobacco juice’ (technical term) onto our fingers and hands when we grabbed them. In addition to staining skin, tobacco juice is kind of stinky. Clever studies revealed that lubbers often dine on plants whose leaves are loaded with bitter secondary plant chemicals. That may be why the vomit of lubbers is repellent to invertebrate predators such as ants. An opening on the side of the lubber’s body emits a noxious froth produced by glands within the exoskeleton. If this array of defensives tactics is not enough, lubbers have one more trick – repellent froth. When under attack, eastern lubber locusts produce noxious, frothy foam from a breathing port, called a spiracle, on the side of their body. This foam is a veritable witch’s brew of aromatic and irritating chemicals that hisses and bubbles upon release. Body armor, spines, and chemical weapons help these ancient giants of the grasshopper kingdom survive and thrive in an ever-changing world. Delightful references including “Large size as an antipredator defense in an insect” by Douglas Whitman and Shawn Vincent, “Secret weapons” by Thomas Eisner, Maria Eisner, and Melody Siegler, and “For the love of insects” by Thomas Eisner, formed the factual basis for this week’s episode. Thanks to Dr. Shrewsbury for wrangling and photographing lubber locusts and to the remarkable Audubon Corkscrew Swamp Sanctuary for providing inspiration and thespians for this week’s episode.